Ready to spend some time without half of our defensemen and our goalie? The camp will culminate with a pre-tournament game against the BU Terriers on Dec. 19 at 7 p.m. ET. For hockey w31d0z that sounds pretty interesting. Think sans Eichel BU would get smoked. b0mberMan wrote: Ready to spend some time without half of our defensemen and our goalie? Mostly over break. We will be without for the 2-3 games over break. I wonder if Santini will stick on the final roster, just coming back from injury. If you haven't watched in the past, it's a really fun tournament esp the Canada / USA games as the turn to referendums on each country's development system. CENTRE: Eichel, who is Connor McDavid's No. 1 challenger to be first overall pick in the 2015 NHL Draft, and Matthews, the Arizona-born product who is touted at No. 1 for 2016, will be Team USA's one-two punch up the middle. RIGHT WING: There are two wild cards on the right side – 1997-born, 2015-draft eligible Jeremy Bracco, who is knocking down U.S. U-18 scoring records of Pat Kane and Phil Kessel, and 19-year-old Noble and Greenough Prep School's Miles Wood, the New Jersey Devil fourth-round pick (2013) who is the son of former NHLer Randy Wood – challenging five bona fide NHL prospects, four of whom are 19. Minnesota first-rounder Alex Tuch of Boston College and University of Minnesota returnee Hudson Fasching, the Los Angeles King draftee whose NHL rights now belong to Buffalo, appear to be locks. DEFENCE: Many question marks on the Team USA blueline; much potential or upside. But the most important question mark is the health of returnee blueliner Steve Santini of Boston College. The 1995-born New Jersey Devil prospect is still rehabbing from wrist surgery on Oct. 28 and hasn't played since then. There's some question as to whether he'll be ready to go by the Dec. 26 opener. If he's healthy enough to play, Santini could be Team USA's captain and the steadying influence on what will almost certainly be a highly-skilled, mobile but young defence. 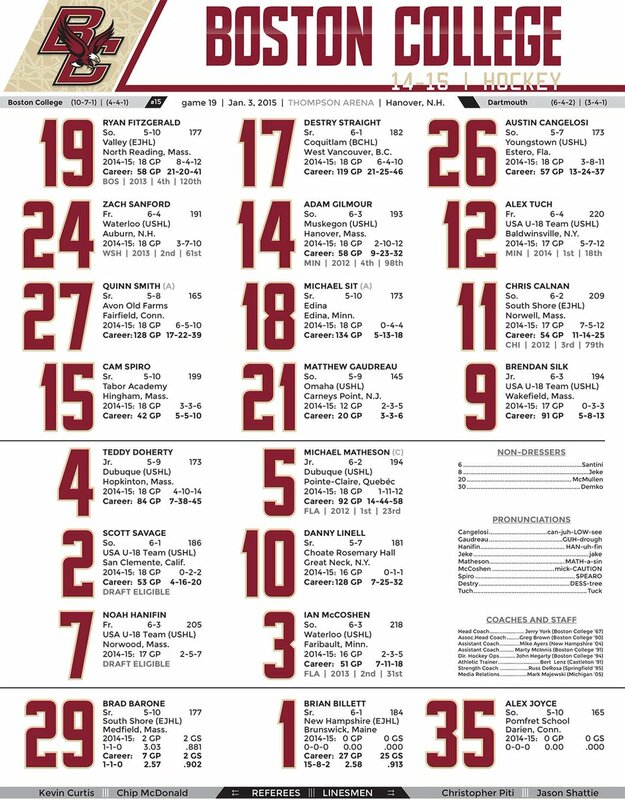 Will Butcher, a University of Denver player drafted by the Colorado Avalanche, and Ian McCoshen, a Florida Panther prospect who plays for Boston College, are returnees on the left side blueline from last year's WJC team. But they're going to get pushed, and pushed hard, by the 2015 draft eligibles Hanifin and Werenski. Both are outstanding skaters with high-end offensive ability. Michael Downing, a University of Michigan player and Florida Panther prospect, is a steady defensive defenceman who'll also contend for a spot on the left side. On the right side, if Santini can't go, it creates an enormous hole. Apparently Santini is meeting with the doctor today so perhaps we'll have a little more clarity soon. GOAL: Returnee Thatcher Demko of Boston College, a Vancouver Canuck prospect, is expected to be no worse than one of Team USA's two goalies and could be the starter. He'll be challenged by a pair of OHL netminders – Carolina prospect Alex Nedeljkovic of the Plymouth Whalers and New York Ranger prospect Brandon Halverson of the Soo Greyhounds. Areed. I tuned in when Gaudreau was on the roster (same reason I'm logging more Calgary games than Ranger games this year) and got into it. Definitely fun. 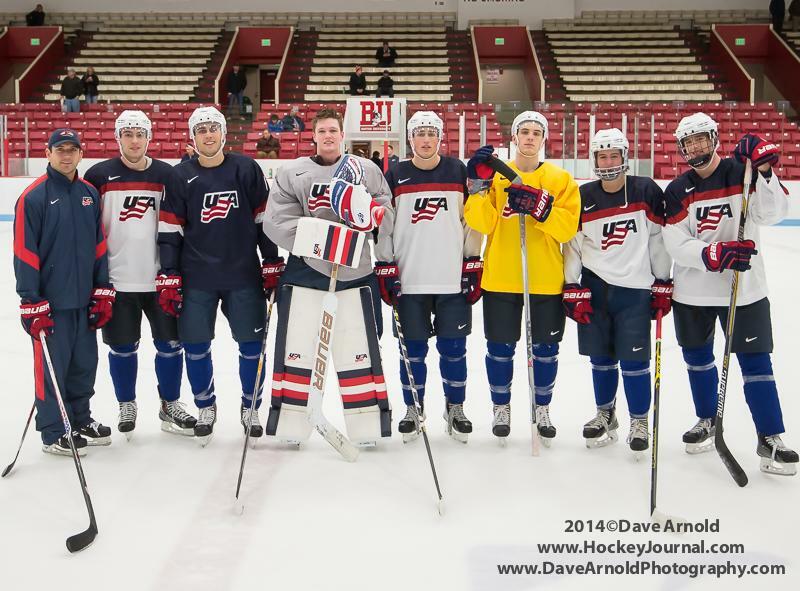 Boston College sophomore Steven Santini probably didn’t know what to think about his chances for being part of the United States National Junior Team for the 2015 IIHF Junior World Championship when he injured his right wrist in late October. Santini, a second-round pick of the New Jersey Devils in 2013, hasn’t played since Oct. 25, when a fluke run-in with a player from University of Massachusetts in the corner led to the injury. Santini had surgery a couple days later. Santini wore a yellow “no-contact” sweater during the two practice sessions Tuesday. He took part in some drills, but when the battles started he was relegated to skating alone in the opposite end zone. Santini expects to be cleared for contact in the next day or two, but he’s unsure when he’ll be able to play in games. It was important to United States general manager Jim Johansson that Santini get to participate in the camp, which runs through Friday. The U.S. could obviously use a 6-foot-2, 200-pound defenseman with experience both on and off the ice. "We are going to give him as much time as we can,” Johannson said. “He's been skating and is in great shape but he just hasn't played a hockey game, so ... we talk about body of work and character and all those things. Lot more will be addressed with Steve on Dec. 23 and beyond. He'll skate around here and it'll be what he can and can't do. “He is without a doubt a guy we want on the team. He's a character kid and he brings everything the World Juniors is all about and we're going to give him as much time as we can to know. To me it'll come down to more to Steven saying, ‘I can go’ or ‘I can't.’ We've made it clear with the medical team they have to tell us the status. They've been handling him and a lot more will be known after Dec. 22. If the kid can go, I want him going." Santini is one of three defensemen returning from the U.S. team that failed to medal last year. He’s not above being a source of moral support until he can fully assert himself in the practices. It’s in Santini’s nature to be a mentor, whether he’s injured or playing. Defenseman Ian McCoshen is another returnee from the 2014 U.S. team and he’s Santini’s teammate at BC. He knows how valuable Santini could be once the tournament starts. Spokane has traded the rights for G Thatcher Demko to @WHLHitmen in exchange for conditional 2015/16 draft selection(s). Source close to Demko: "He's not leaving BC." ... ICYMI, Calgary traded for his WHL rights earlier today. Source close to Thatcher Demko says Demko is "not leaving BC." Spokane contacted him Saturday. Calgary today. "Fully committed" to BC. Hitmen GM Mike Moore tells Sportsnet960 "we have no indication (Demko) is coming"
There is speculation that Jack Eichel could possibly be joining the Saint John Sea Dogs. Sportsnet tweeted the news today. Lot's of talk/speculation about Jack Eichel leaving BU for Saint John of the Q after the WJC on the 'Junior' podcast today. Will be up soon. The 18-year-old, Chelmsford, Mass., native is a top prospect eligible for the 2015 NHL Entry Draft and could be leaving Boston University after the World Juniors and finally play in the QMJHL. He currently has eight goals and 27 points in 16 games with Boston University. Eichel has been drafted into the QMJHL twice. The first time was in 2012 when the Halifax Mooseheads drafted him 15th overall. The second time was in 2013 when Saint John drafted him in the 10th round. He will be representing Team U.S.A. at the 2015 IIHF World Junior Championship in Montreal and Toronto beginning Dec. 26, 2014. Eichel wouldn’t be the first player to leave Boston University and play for the Sea Dogs as Charlie Coyle did the same mid-way through the 2011-12 season. The Eichel thing doesn't make sense to me unless he decided he hates going to class and why bother sticking it out for another 4 months when you're leaving at the end of the year anyhow? flyingelvis brings up a good point, at what stage is one truly a student at bc? Demko, Santini & McCoshen all scratched for tonight. All are locks to make the team assuming health, think both will get letters as well. claver2010 wrote: Demko, Santini & McCoshen all scratched for tonight. All are locks to make the team assuming health, think both will get letters as well. Both as in Santini/McCoshen I assume? Hanifan had a shorty last night and apparently BU only got one shot off on goal in the 1st period. I know its not an apples to apples comparison, as they are probably playing some guys who sit in the stands/making sure they don't get hurt out there/trying different line combos, but last night was an interesting thought exercise in what BU can do without Eichel. Re McCoshen & Santini, correct. Unfortunately (or maybe fortunately for BC fans if he doesn't miss the Dartmouth tourney), I think it's unlikely Santini is going to play. Still not cleared for contact and believe he still has his cast on. Saw the 15-1 shot disadvantage, pretty funny. 1. Miles Wood isn't a Rhodes Scholar candidate apparently. A 20-21 year old freshman at this pace. eepstein0 wrote: 1. Miles Wood isn't a Rhodes Scholar candidate apparently. A 20-21 year old freshman at this pace. 2) Seeing either Milano or Eichel set up Tuch is pretty impressive. Haven't caught a game yet, but how is Tuch looking? I've been impressed with his progression as the 1st half of the season went on. He's gaining confidence and is starting to not be afraid to shoot it. The Michigan game, in particular, I was pretty excited with how quickly he can get a good, hard, shot off in tight spaces. In hoping the team turns it up in the 2nd half, I'm watching Tuch to be a difference maker up front. b0mberMan wrote: Haven't caught a game yet, but how is Tuch looking? I've been impressed with his progression as the 1st half of the season went on. He's gaining confidence and is starting to not be afraid to shoot it. The Michigan game, in particular, I was pretty excited with how quickly he can get a good, hard, shot off in tight spaces. In hoping the team turns it up in the 2nd half, I'm watching Tuch to be a difference maker up front. Milano I'm not surprised to here but Wood? Wow. He's got a monster of a shot and players simply bounce off of him along the boards. BC wise I don't think York has found players that complement his skills.